With 65 percent of U.S. adults on social media, your business presence on these channels should be a given. But just being present isn’t enough. Social media is about social interaction. Your goal should be to engage customers, build relationships and stay top of mind. That’s how you get repeat business and referrals. But to do that successfully, you need a firm grasp of social media etiquette. Here are 15 tips to get you started. 1. Give your social profiles the attention they deserve. Your social profiles often make your first impression on potential customers, so it’s important to present your brand in the most professional way possible. When you leave your profiles incomplete, you don’t come across as fully engaged. Set up and complete one profile per network, and be sure to use the same business name on all profiles. Keep branding as consistent as possible, using the same profile pictures, logos, and color schemes whenever possible. 2. Always provide valuable, network-appropriate content for your audience. This is one rule of social media etiquette you don’t want to break. If you’re spamming your followers with irrelevant content and advertisements, plan on losing them. Think about what your followers want and expect from your brand, and do your best to deliver it. Keep in mind, each social network is different in format and tone. What works on Facebook may not work on Instagram. Even if your topic will work across networks, always be sure to tweak the message to suit the tone and format of the platform. 3. Respond thoughtfully to your audience. No other rule of social media etiquette is broken quite as often as this one. If someone takes the time to reach out to your business on social media, whether it’s a comment, question or complaint, you should take the time to reply. As a rule of thumb, treat a customer who reaches out online with the same respect you’d treat someone who walks into your place of business. 4. Cleary distinguish your Facebook business page with your personal account. There’s a reason Facebook has business pages. Think of it this way. The prospect who “likes” your business page is opting into your brand and giving you permission to provide valuable content in their News Feed. Your friends and family added on your personal page, however, have not opted in. They may see that same valuable content as spam, which does nothing for your business reputation. On the flip side, getting too personal on your business page can have a negative effect on your followers. They’re following you because they want your industry expertise. Unless you’re Gordon Ramsay or a restaurant owner, daily photos of your lunch and dinner are irrelevant – and you will lose followers. 5. Don’t beg for Facebook likes. Continuously asking for “likes” on Facebook just reeks of desperation. Sure, it’s okay to ask your friends and family to like your business page once, but don’t harass them about it. The same thing goes for industry influencers, business colleagues, and potential customers. Instead, try to earn their likes by providing valuable, shareable content. As that content is appreciated and shared by new contacts, your audience will expand organically. 6. Stay active on Facebook, but don’t overdo it. Don’t let your profile sit dormant for extended periods of time. Staying active helps maintain interest and keep you top of mind. 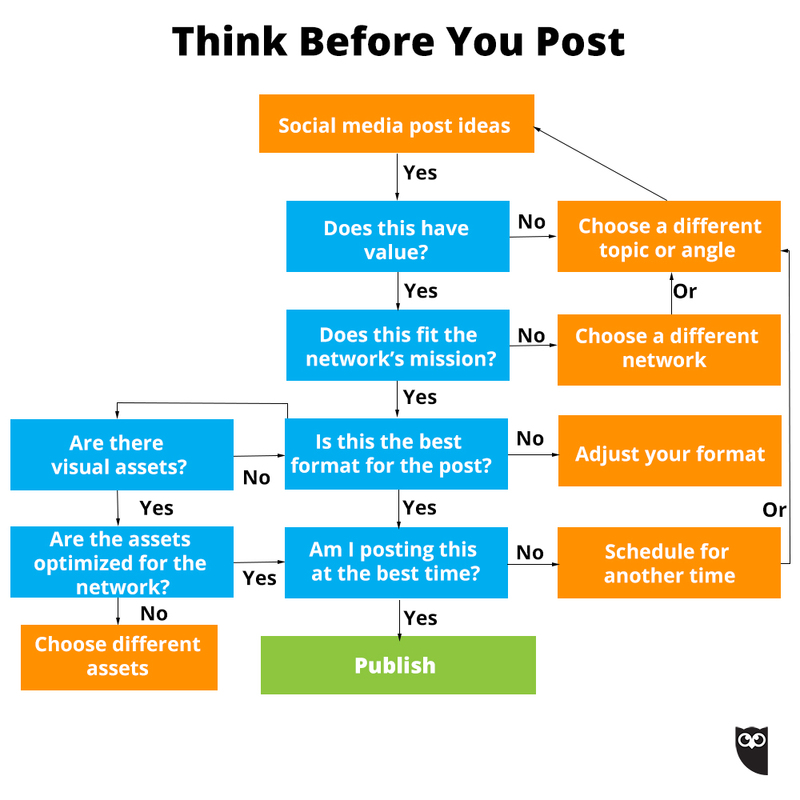 However, be reasonable about your posting schedule. If you post too often, your followers may tire of your updates. Remember, your followers are looking for quality, not quantity. 7. Use your Twitter character count wisely. Twitter may have expanded their character limit, but you don’t have to use them all. Instead, keep your messages to 100 characters or fewer whenever possible. This allows other users to retweet your comments without editing your message. Bonus Content: Grab a copy of our Social Media Field Guide. 8. Don’t get carried away with retweets. Retweeting interesting content is fine, but if that’s all you do, you’re not really contributing to the conversation. Eventually, your followers are going to cut you out and get their content directly from the source. Focus on providing original content. When you do retweet, give it a personal touch by adding a short comment. 9. Go #easy with the #hashtags. Excessive hashtag use not only makes your tweets unattractive, it can also irritate your audience. Studies have shown that using more than two hashtags on Twitter can actually result in a 17 percent drop in engagement. 10. Always send a personal message when connecting on LinkedIn. If you want to make a professional connection, a personal message beats a generic template every time. Where the template request leaves the recipient guessing as to how they know you, a personal message allows you to provide some context – who you are and why the connection might be beneficial. Remember, this is the beginning of a beautiful, albeit business-oriented, friendship. Make the extra effort! 11. LinkedIn isn’t Twitter, so keep the posts to a minimum. Posting relevant content on LinkedIn is a great way to cement your status as an industry thought leader. But if you get carried away and start clogging up your contacts’ feeds, you can go from hero to zero in no time flat. Avoid excessive posting, and keep your shares meaningful. 12. Thoughtfully give LinkedIn endorsements. We’ve all received LinkedIn endorsements from friends and family who have no idea what we actually do at our jobs. Hang around on LinkedIn long enough, and you’ll receive similar endorsements from people you haven’t even met. Maybe they think you’ll return the favor? Your endorsement should mean something. Only endorse connections you’ve actually worked with in some capacity. And if you do endorse a business connection, don’t ask for an endorsement in return. Unprompted endorsements will come, and they’ll mean that much more. 13. Always provide context to your Instagram photos. They say a picture is worth a thousand words. Of course, the true value of that proposition depends heavily on the words that are chosen. Don’t leave your followers guessing. Take advantage of captions. Use them to add context to your posts and to tell your brand’s story. You can also leverage relevant hashtags and when location matters, geotags, as seen below. @meritcoffee is one of the latest coffee shops focused on delivering the perfect cup of brew from some of the finest beans in the world. . ☕Their Slow Drip roast and the house latte is arguably the best in town. 14. Use relevant hashtags on Instagram. We touched on this with Twitter, but it’s worth mentioning again. Instagram allows up to 30 hashtags per post, so it’s easy to go overboard. Focus on relevant hashtags for a better response. 15. Have fun with Snapchat. Since Snapchat allows only up to 10 seconds for photos and videos to be seen by your followers, it’s okay to have a more lighthearted and fun approach. It’s commonly used to go behind the scenes or give an insider’s view of a brand. And if you want to share more content, you can always use the Stories feature. This lets you add Snaps together to form a narrative that lasts for 24 hours. And with that — tweet, post and be merry! We hope these 15 rules of social media etiquette will help you make more meaningful social connections this year. But remember, if you need any help, we’re always here to automate the process. Enter your information to download the guide.